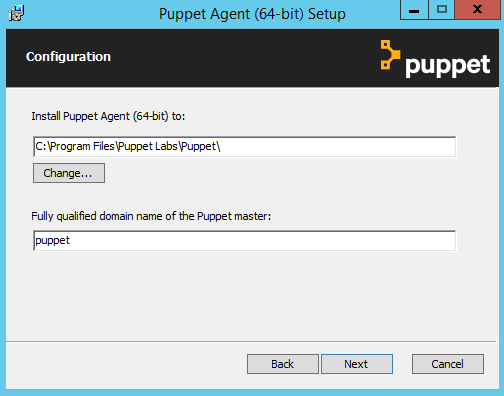 Install the Puppet agent so that your master can communicate with your Windows nodes. Before you begin: If you’re using Puppet with a master/agent configuration, you’ll need a *nix node to act as your Puppet master. Read the pre-install tasks. 64-bit versions of Windows must use puppet-agent-<VERSION>-x64.msi. Note: Puppet agent will prevent you from running the 32-bit version on a 64-bit Windows system, this functionality was deprecated in Puppet 4, and removed in Puppet 5. 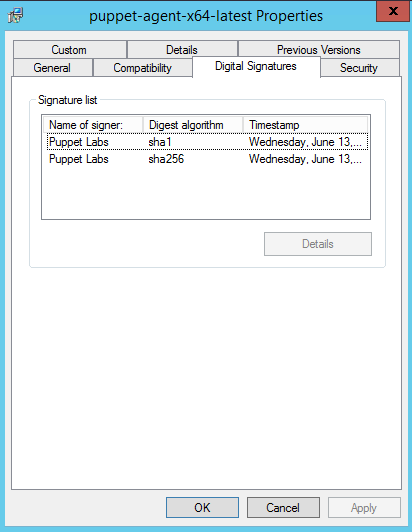 Note: Puppet dual-signs puppet-agent packages. You might see a warning from your browser saying the signature is corrupt or invalid. During installation, Puppet asks you for the hostname of your Puppet master server. This must be a *nix node configured to act as a Puppet master. Once the installer finishes, Puppet will be installed, running, and partially configured. Use the msiexec command to install the Puppet package. Optionally, you can specify /l*v install.txt to log the installation’s progress to a file. These options are only available when installing Puppet on the command line. Specifies where Puppet and its dependencies should be installed. The hostname where the CA Puppet master server can be reached, if you are using multiple masters and only one of them is acting as the CA. This sets a value for the ca_server setting in the [main] section of puppet.conf. Default: The value of the PUPPET_MASTER_SERVER property. The node’s certificate name, and the name it uses when requesting catalogs. This sets a value for the certname setting in the [main] section of puppet.conf. For best compatibility, you should limit the value of certname to only use lowercase letters, numbers, periods, underscores, and dashes. (That is, it should match /\A[a-z0-9._-]+\Z/.) Default: the node’s fully-qualified domain name, as discovered by facter fqdn. When you uninstall Puppet, the uninstaller removes Puppet’s program directory, the Puppet Agent services, and all related registry keys. It leaves the $confdir, $codedir, and $vardir intact, including any SSL keys. To completely remove Puppet from the system, manually delete the $confdir, $codedir, and $vardir. The easiest migration path to upgrade is to compensate for redirection, using the $system32 fact, available in Puppet 3.7.3 and later. This fact automatically compensates for file system redirection. You need to ensure any manifests also use this fact, and that any modules you are using are not affected by redirection. The best way to do this is to check the READMEs for the module. The installer specifically stores information in different areas of the registry to allow rolling back to the 32bit agent. For more information, see compensating for redirection.